Legislation requires businesses with women’s commercial bathrooms to provide necessary and adequate means to dispose of sanitary towels and pads. The Workplace (Health, Safety and Welfare) Regulations 1992 state that “In the case of water closets used by women, suitable means should be provided for the disposal of sanitary dressings” , and your business must comply with these regulations if any number of women use your bathrooms. Envirotec offer sanitary bags and sanitary bins for sale, as well as sanitary bin collection, so you can provide the right facilities for your female staff and/or patrons without worrying about managing the disposal of this waste yourself. Our team offer prompt, efficient solutions that won’t disrupt your daily operations – we can arrange a collection date with you for your complete convenience, and we’ll pick up and dispose of your waste properly and safely. 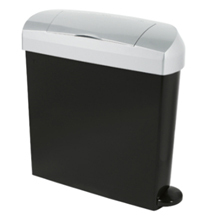 We offer sanitary bins with volumes of 20 or 15 litres, available in grey or black colourways. Our sanitary bags prevent contamination of the bin and other areas, and we’re always on hand to arrange delivery and collection of this equipment should you need it. For more information, please get in touch with us today. Available in 20 Litre and 15 Litre bins in dark grey or white colours. Discreet pedal operated bin. Discreetly dispenses bags help prevent bin contamination and the spread of germs and bacteria, providing users with a fresher, safe and more hygienic disposal of sanitary products.